The approaching winter season means that for many, grilling season is over. The spring, summer and fall are prime grilling seasons in most of the country, and it is a good idea to put your gas grill and propane tank in storage if you are done grilling for the winter. You must remember, however, that propane tanks are not like any other piece of outdoor furniture that you can just throw into a corner of your garage. These tanks are filled with a flammable gas and if they are stored incorrectly, they could become a serious fire hazard. In fact, just one propane tank can blow up an entire house. As you put your gas grill and propane tanks in storage for the winter, make sure you follow these safety tips to ensure that they are stored correctly. Once you have decided to pack up your propane grill for the winter, the first thing you must do is disconnect the propane tank from the grill. Make sure the valve at the top of the tank is closed before disconnecting the hose to avoid spillage. The grill itself is no longer a fire hazard with the propane tank detached, so you can cover the grill and store it in a garage or shed where there is space. The propane cylinder must be carefully inspected before it can be stored to check for leaks or overfill. 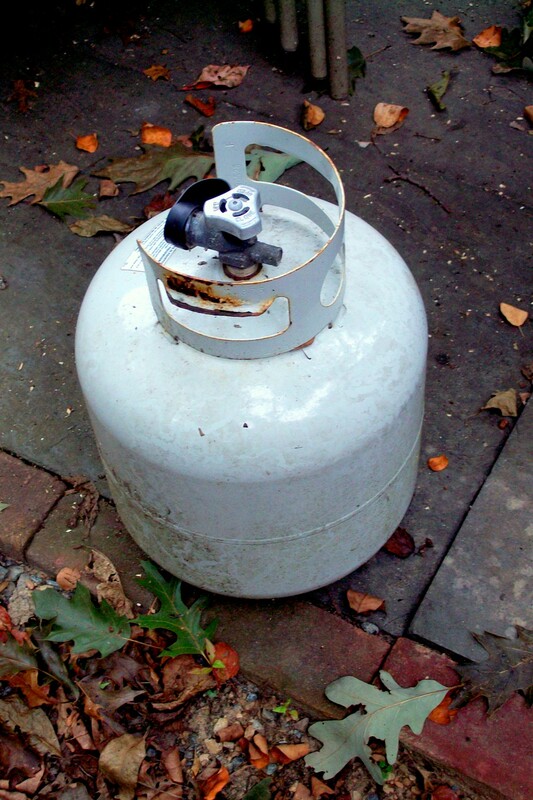 Inspecting the propane cylinder for leaks is extremely important because a leak can cause a fire or even an explosion. First, take the propane tank to an open, well ventilated area and check near the valve and connection points for signs of a leak. You can enlist the help of a professional that can check for leaks using a special solution, or use a solution of soap and water to check yourself. You should also take notice of any odor coming from the propane tank because this could be a sign of a leak. If there is a rotten egg type of smell coming from the propane tank or liquid leaking from the valve or connectors, leave the tank in a well-ventilated area and call the fire department. Pressure Relief Valve: Check the pressure relief valve if your propane tank has one. If the valve goes off, that means that the tank is either too full or was affected by a change in the weather. A professional must be called for further inspection in both cases. Signs of Leaking: Check for leaks using the steps described above and immediately call the fire department if there is a leak. much the tank weighs when completely empty. Weigh your propane tank and subtract the tare weight from the total weight. This will give you the weight of the propane within the tank. Next, divide this number by 4.2, and this will give you the number of gallons within the tank. If there are more gallons of propane in the tank than the tank can handle, then it is overfilled. The first thing to remember about storing your propane tank is that it must be stored outside, not in the house, garage, or shed. Only completely empty propane tanks should be stored inside. Inside storage can cause the temperature inside the propane tank to rise quickly which is dangerous. It is best to put your tank on a flat surface in an open, well-ventilated area at least 10 feet away from anything flammable. The tank must also be stored above the grade of the yard and away from the home because leaking gas will sink to the lowest air level. If the tank is too close to the home and there is a leak, propane gas may fill your basement. The propane tank must always be stored securely in the upright position to prevent leaks. If you are ready to put your gas grill in storage for the winter, make sure you carefully follow these propane safety tips to safely and securely store your propane tanks. You must inspect your propane tanks closely and be ready to call 911 if you notice that your tank is leaking or overfilled to prevent a fire or explosion. If your property is somehow damaged by a propane leak, you must contact a fire damage restoration professional to help clean up and restore the damage. These professionals can help prevent permanent damage and restore the affected areas to their original condition. 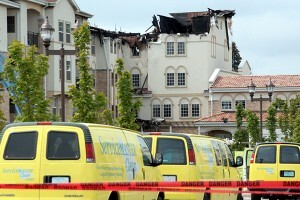 Professionals such as ServiceMaster can provide some peace of mind after any fire damage emergency. They are available 24/7 and will arrive within 2 hours of your initial call to remove the smoke and soot residue from the affected surfaces. Don’t hesitate to give your local provider a call!